These native European woodland plants are among the earliest to flower producing a bright display when planted in large numbers under shrubs and deciduous trees. An efficient ground cover plant, it quickly spreads to become a carpet of pure golden yellow, just as the first snowdrops begin to bloom. 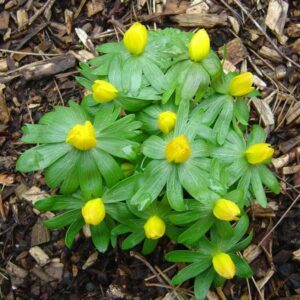 As a member of the buttercup family (Ranunculaceae), the winter aconite (its Latin epithet hyemalis also means of winter) has small, cup-shaped flowers which are surrounded by bright green bracts that look like a collar around the blossom. Once the flower fades, dark green leaves, which are divided into several finger-shaped lobes, appear from the underground tuber. Eranthis hyemalis is good for naturalising under trees, large shrubs or in lawns. They combine nicely with hellebores and echo the flower colour of forsythia and Hamamelis, witch hazel. Because of their small size, they are best planted in large drifts when they really make an impact.